Home » Who came up with the "yellow vests"? Protests in France, which have been going on for more than two weeks, are becoming more and more shocking. It all began in mid-November with appearances against rising fuel prices; now the demands of radical measures, including the resignation of the government and the head of state, are increasingly being heard. A new wave of protests began in the country over the weekend. Their character has become much more aggressive, and the consequences, first of all for Paris and other large cities, are becoming more pitiable. Young people, covering their faces with masks, began to set fire to cars and buildings, smash shop windows (they could not do without looting), and attacked the police. Even the Triumphal Arch suffered, which the vandals "decorated" with numerous graffiti. The guardians of order did not remain in debt, using various means to counter the initiators of the unrest: from water cannons and rubber bullets to tear gas and light-noise grenades. Unfortunately, not without dead and injured. The most egregious incident occurred in Marseille, where a projectile flew through the window to an 80-year-old woman and hit her in the face. December 3, it became known that the victim died. In addition to her, at least three more people died as a result of the riots, the number of victims exceeded 130. Among them are not only law enforcement officers, but also 12 journalists. The number of detainees by law enforcement officers reached 680 people (more than 400 of them in Paris), the first hearings have already taken place, following which 111 decisions were made to leave in custody for further proceedings. They will be charged with various charges. 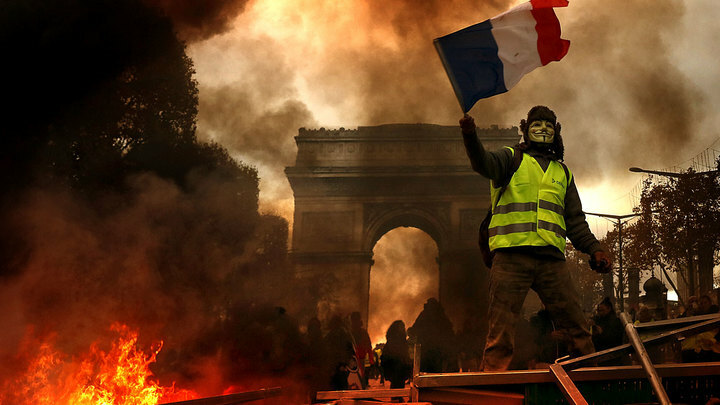 The main feature of these unrest, the driving force of which is the "yellow vests" (the protesters can be recognized by the emergency vests of the corresponding color), was the fact that nobody seemed to be behind them. Not a single political force binds itself closely to what is happening. It is clear that trade unions, various public organizations, as well as the Association of Farmers, in which the price increase for the same diesel engine is already very painful, traditionally come out in support of people who have taken to the streets. However, they all simply have something in common with the protesters in their complaints against the French authorities, in no way coordinating the speeches themselves. And these claims have really accumulated a lot, and the tightening of taxation, which, according to the idea of President Emmanuel Macron, should reduce France’s dependence on minerals, here is only the tip of the pyramid, which is expanding to its base, adding new requirements. This includes raising the minimum wage, reducing the retirement age to 60 years, and cutting down the cost of maintaining officials, as well as tightening control over the arrival of migrants in the country. The president himself tries to refrain from detailed comments by limiting himself to calling the actions of the "yellow vests" shameful and spoiling the country's image. The head of state shifted the burden of solving the problems to Prime Minister Edouard Philip. In France, by the way, this is a common thing. Domestic political issues most often have to be addressed precisely to the second person of the state, while the first deals with foreign policy. True, Macron has already canceled his visit to Serbia. However, it is clearly not going to go into direct dialogue with the protesters. On Monday, December 3, at last, the Prime Minister met with leaders of political parties and representatives of the "yellow vests." Two days before this, the latter refused to meet, citing the refusal to broadcast the talks live. “We were denied the broadcast of the talks on television on the air. In this regard, we decided not to compromise, ”said one of the eight authorized delegates, Jason Herbert, on Saturday, December 1. Nevertheless, the meeting took place, but it is unlikely that someone would call its results satisfactory. The only significant result was the decision to hold parliamentary hearings on the issues identified, but one of the participants in the talks, the leader of the center-right Republicans Laurent Wokier, said that the government does not realize the full depth of the people's anger. Also on the radio Europe-1, protester Christoph Chalenson voiced a new demand for "yellow vests", according to which the government should be headed by the former chief of the General Staff of the French Armed Forces Pierre de Villiers. The need for Macron’s resignation is already taken for granted, especially since his rating is even lower than that of Edouard Philip by 10%, dropping below 25%. Meanwhile, the situation continues to heat up. On the same day, protesters blocked the roads at once to 11 fuel storages of the oil and gas concern Total, which caused a shortage of gasoline and diesel at hundreds of gas stations. The edition of Le Figaro indicates that 2.2 thousand refueling is about to end, and Total owns only 75 of them. Agence France-Presse reports of unrest in several regions of the country, which were caused not only by problems in the oil and gas industry. In particular, in the port of Fos-sur-Mer on the Cote d'Azur, “yellow vests” cut off from the central roads over and over again the entrance to the marina. The police manage to periodically disperse their pickets, but soon everything starts all over again. Practically all over France, protesters continue to block highways, break traffic cameras, interfere with the work of payment points on toll roads. It got to the point that schoolchildren began to rebel. They protest against the reform of the educational system in France, at the same time expressing their support for the "yellow vests". Students blocked more than a hundred high schools in different regions of the country, in some of them even clashed with the police. So, in one of the suburbs of Paris, schoolchildren set fire to garbage cans and a car parked near their school. In other cases, wooden pallets and boxes are used for blocking. In the Auvergne-Rhône-Alpes region, peace officers even used tear gas against aggressive young people. What is happening now in France is already compared with the events of 1968, when the social crisis that began with student speeches and demonstrations, turned into riots and multi-million strikes. In the end, it all ended with the resignation of President Charles de Gaulle and the change of government. Of course, such a radical outcome is still very far away, however, the mentioned comparisons are heard not only in the media. They can be heard from the officials. Thus, the Mayor of Paris, Anna Hidalgo, assessing the consequences of the riots and the scale of the violence accompanying them, recalled just the events of half a century ago. Is French stability being demolished from abroad? What is happening in the year 2018 shows that the vaunted Euro-stability not only cracked but also begins to show signs of destruction. At the same time, there are opinions that the absence of an obvious leader of the protest movement in the country suggests that the process is controlled from abroad. For example, Germany or the United States. Now some serious compromises are expected from the president, and he is hiding behind the prime minister. People are waiting for the head of state to appeal to people with a television message, at least to show that he hears the voice of the people, but this is not happening. Given the unusual nature and structure of the protest movement, it is not easy to predict further developments. Refusing unpopular changes in tax legislation and satisfying at least part of the protest’s demands means admitting one’s weakness. Macron, who has been at his post for just over a year, is not ready for this. Anyway, bye.